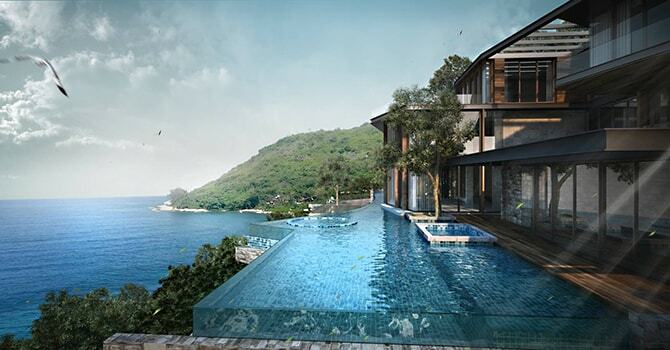 Modern 9 bedroom, 3-pool luxury beachfront villa in Nai Harn, completed 2017. All facilities and numerous social spaces inside and out. 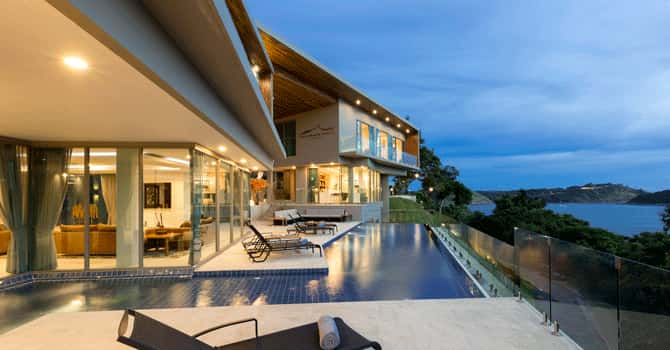 New 6 bedroom luxury villa on it's very own private beach in Nai Harn, with panoramic views from the pool and the expansive floors and rooms above. Nai Harn is widely considered one of the most beautiful beaches in Phuket, and yet the area is still not overcrowded. While you probably couldn't describe it as totally undiscovered, there is ample room to stretch out and enjoy the long swathes of white sand. Those who vacation in a Nai Harn villa are sure to love the area's restaurants and amenities, as well as the stunning beach. 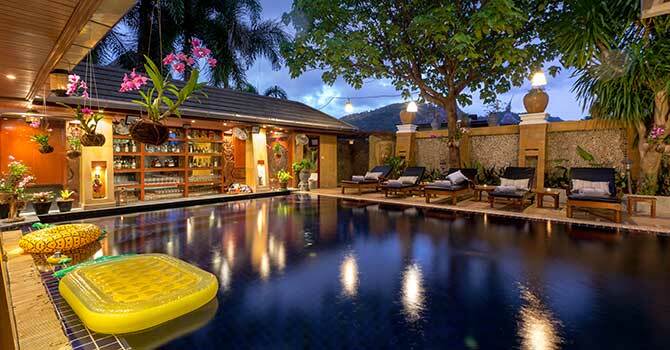 The area is located in the south of Phuket, so is a little bit removed from the hustle of the popular west coast. There are still plenty of restaurants and shops to enjoy along with its authentic and uncrowded feel. It's no wonder it is popular amongst both locals and Thais. Its peaceful location means it is a little out of the way to get to - expect the trip from Phuket airport to take about an hour and a half, however it is a picturesque drive once you get out of the traffic. Nai Harn is one of the most beautiful beaches, with a long curved swathe of soft sand, with lush tropical foliage to one side and clear azure waters to the other. Most of the time, you can expect to see a spattering of luxury yachts moored as their owners take advantage of the beach villas in Nai Harn. During high season, the beach offers excellent swimming with calm, warm waters that are suitable for swimmers of all ages. The beach's location in the south means that it is less crowded than some of the most popular west coast beaches, however you will certainly not be lonely - especially in December and January. As well as swimming in the azure waters and sunbaking on the beach, there are other water-based activities to enjoy at the beach. There is some great snorkelling not far from the shore, and you may also like to hire a kayak or a stand-up paddle boarding for a different seaside experience! The beach also features an inlet lagoon which is today flanked by some people renting rowboats - great fun for the whole family and especially for those looking for something different to try. You can expect to enjoy stunning Thai food as well as beautiful beaches. There is a good selection of humble restaurants that serve delicious Thai classics at very affordable prices, or perhaps indulge in a more upscale restaurant at one of the luxury resort restaurants. One classic experience to enjoy in Nai Harn is to purchase some delicious fresh fruit and enjoy it on the beach. Or, load up on delicious tropical fruits such as mangoes and dragon fruits to enjoy a private tropical feast by the pool. Nai Harn is also home to a beautiful temple that has recently been expanded and is a site of great significance for local Thais. The location of this temple right in the midst of the area has also stymied overdevelopment, and contributed to the authentic feel. A little further afield, Windmill Viewpoint is a fun excursion and will give you stunning views out over nearby Ya Nui Beach. The beach itself is a quiet alternative to Nai Harn and great for doing something different if you've spent a few days at your villa. From nearby Phromthep Cape, which forms the southern cape of Phuket, you can take in beautiful sunsets and sunrises, which often feature striking reds, yellows and pinks. Another popular activity in Nai Harn is indulging in a relaxing and therapeutic massage. There are many massage spas that offer a range of therapies including Thai, Western and Swedish massage. Overall, Nai Harn is a beautiful place to stay - it's no wonder that its popularity is increasing and that it has been voted as one of the most beautiful beaches in Asia. One look at the stunning beach lined with forest and it's sure to remind you of all your tropical island paradise daydreams! So, what are you waiting for? Why not start planning your dream holiday and deciding on your favourite activities?